Ok I’m with Sharon and I’m looking for the link. You also had me at the environmentally conscious company as I’m all about saving the planet. Ok I’m with Sharon and I’m looking for the link. You also had me at the environmentally conscious company as I’m all about saving the planet. The add is an excellent elevator pitch. It is certainly an attention grabber. Great idea and pitch. You are very thorough, and I am impressed with how comfortable you are talking in front of a camera. CEO Credibility/Management Team: The company is comprised of three individuals. You come from a public education background, and the other two members have experience in software development and system administration. Business Model: The company is offering the Linux-server Terminal Project. 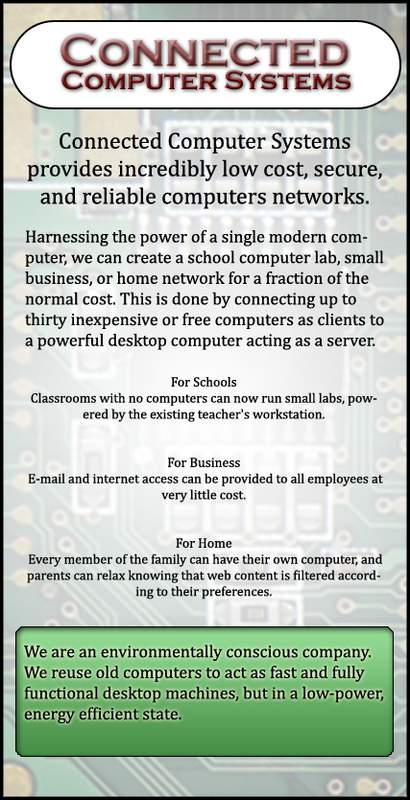 They offer low-cost computer options to schools, businesses, and for personal use. The idea is to use one newer and faster computer to act as a server for older ones. This will allow schools to integrate technology in the classroom for much less money. You outline three main customer groups for this technology (education, business, and for personal use). I agree that your main target group should be schools. Most appealing is the cost benefit of using your technology and support, and removing internal IT support staff. However, how will your support be delivered to schools and will you be in schools? I am not too sure how IT support staff work in schools currently, but are they available around the clock? In regards to business, I can see this technology being used in not-for-profit situations and charitable organizations. Also, I think that if you could work with the government to supply tax rebates for companies choosing this type of technology for environmental reasons, you might be onto something. For personal use, I don’t think it is bad idea, but I would like to understand the need for multiple computers on a server in a home environment. Is the functionality similar to a netbook? How can you set restrictions on content? Will the functionality be too limited, such as the concerns with a netbook? Market Readiness: There is a need for computers in public school. Cost for this technology is a bonus. The environmental aspects of this technology are very attractive. Technical Innovation: This is a really interesting idea. I would really like to see it in action and test it myself. I am still having a hard time getting my head around how everything links together. Regardless, the technology sounds very innovative. Not only does it provide environmental solutions, but the cost is much less, and the product is highly customized for the customer. It seems like a sound idea to me. Exit Strategy: I am not too sure what success looks like, but it really sounds like there isn’t much to lose. The overhead costs are low and the company operates on-site and out of the homes of the company members. Overall Investment Status: Bryon, this is a fantastic idea and I think you are on to something. I would really like to try out the technology and see what you are talking about. I am not convinced, as a new company, that you should be focusing on so many customer groups right at the beginning. It might be safer to focus on educational settings, and build from there. As a company of three people, it might be easier to tighten the scope of focus until you really get on your feet. cool idea. I don’t know enough about computer networking to make any decisions and a background on that topic may have changed my decision to take a better look at your service. Also it sounds like you might be able to market your idea as an eco friendly alternative having people donate their old hardware rather than chucking it. It sounds like you might be on to something here! The notion of “green” is currently the trend when it comes to computers as the waste that is being produced by the computer industry is exponentially taking over the earth. I am not familiar with networking as Tony mentioned but you really have caught onto the “green” trend. The idea of being able to reuse old computers and bringing alive labs is something definitely worth pursuing. I’m hooked! It sounds like an interesting venture and I am definitely attracted to the elevator pitch. I want to find out more about how a classroom without computers can turn into a computer lab – and still be environmentally friendly. As well, I agree with Iris that to be able to reuse old computers and make them faster is definitely worthwhile. Thanks for the thorough look. You’re absolutely right about non-profit groups, etc. as potential markets. The reason that I opted to have solutions for business and home as well is that the setup if about 90% the same for all platforms. Small tweaks means that I can open to a larger market. It does seem a little ambitious though. In my full pitch I mention a platform for getting old computer hardware. In my school, it’s surprising how many computers are sent to recycling every year, so I think this makes sense. When looking at the green angle, I thought about how much more I’m willing to spend on eco-freindly products, so if I could be green and cheap, I figured people might want to take a second look. I’m glad you liked the elevator. Let me know what you think of the whole pitch. I panicked a little when you started getting ‘techie’ with me but you calmly explained it all in real language. This is critically important in sales pitches. No one ever wants to admit they have no idea what you are talking to them about, and if they don’t understand they don’t buy. The example of photocopiers as an example of outside supported technology is a good one. It occurred to me that it might be a mental roadblock for school systems used to internal technical support to outsource. You mention potential limited performance but did not answer that completely for me. I want to know what to expect – slower, less memory storage, more steps to keep it running? I am still not sure. The environmental factor is important for some customers, but not all. Use it judiciously. I want it to work first, be green second. Solve problem one and problem two is a no brainer. If you try to switch them you run the risk of alienating some customers who hold the belief that recycled ‘junk’ is junk. I like the fact you have several markets – schools, small biz with low budgets/requirements, and multi-user home use. This diversifies your customer base and as each of these will have different sales cycles, you can keep your employees working consistently. Sharon, thanks for the feedback. I’m aware of the overly technical side of this product. In fact, to avoid being too techie and alienating the customer, I avoided any reference to Linux in the elevator pitch. If I were to redo this presentation, I would have given some visuals while explaining what LTSP is, and that would have hopefully answered some of the questions. Really, as long as it works, who cares what’s under the hood. This brings me to being green. I agree, it’s got to work, then it’s cool that it’s environmentally friendly. -practical goals that focus on ultimately keeping cost low and improving student learning. Can you compete with the cost of Computer’s For Schools for hardware? Great elevator pitch. Enough information to be intriguing. As schools are struggling to save money while offering technology to EVERY student, your pitch identifies a need. Good job. Byron, further to my original memo to you regarding our interest in your venture, here is a more formal assessment of your proposal. In listening to your venture proposal, I immediately liked the simplicity of your idea. It is a sound and financially viable solution for many of the markets that you are targeting. You have also covered many of the potential concerns that customers may be concerned about. Despite that, there are several areas that I would like to learn more about before proceeding further as an investor. I understand that part of the reason for the low costs of your product is that you use recycled computers and refurbish them. As an educator, it is important to me that when I am teaching a class that the hardware remains similar so that even a simple instruction such as turning on monitors does not result in confusion which may occur if there are five different types of monitors in the room. As a business operator, I know that many office workers prefer to use laptops so that they can work from different locations. Would this be a possibility when away from the main server? As a home user, I know that many children like to play games. Many of these games are not programmed for Linux operating systems. Does this mean that they would not be able to use the diverse titles that are on the market? For all users, I know that computers do break down from time to time. What kind of service do you provide and how would this affect businesses or schools that already employ computer technicians? Overall, I think that your proposal has sound applications but that with the low costs, there are also clearly sacrifices that must be made.